Join the 19th Century research group this semester! The Isaac Newton building is the biggest building that the University has developed and is due to open in April 2017. We are running a competition to design a piece of artwork to fit onto the very large ‘signature wall’ of the atrium space (see the images at the end of this document). The competition is open to all students of the university (undergraduate & postgraduate), as well as staff collaborating with students. This will be a key installation in a building that is named after one of the world’s greatest physicists (who was born in Lincolnshire). The new building will be home to the College of Science and incorporate the School of Engineering, the School of Computer Science and the School of Maths & Physics. The artwork needs to feel appropriate to the building and be in keeping with the academic subject / nature of the environment. The artwork will fill the very large wall (approximately 14.5 metres wide by 8.5 metres tall) and will need to work both close-up and from a distance. The large ‘signature wall’ will be visible from the top of Tritton Road as well as around the Delph Pond, and, along with the building itself, will become both an arrival statement for people driving into Lincoln as well as one of their first impressions of the University. The competition is open to entries using all styles and media, for example: art, illustration, graphic design, painting, typographic, collage, computer generated, hand crafted, photographic, textiles, abstract, montage etc. Whilst the judging panel will be very open-minded to all ideas and suggestions for the design, there are practical requirements that need to be met (including budget, timing, installation, structural issues, appropriateness etc). The deadline for all entries is Friday 3rd March 2017. All final artwork must be entered on flat A3 paper with the single visual of the artwork (to match the ratio of 14.5m wide x 8.5m tall) filling the page as much as possible. Entrants are encouraged to provide one additional page to explain the artwork and visualize how the piece may look applied to the signature wall (please do not supply support work, sketchbooks, development work etc). If creating the image digitally, please ensure that it is created at least at 300dpi, 297 x 420mm, CMYK. Please do not mount any of the images and only paper entries will be accepted. Please submit flat paper entries (not rolled up), to Anna Martin in the College of Arts Office (AAD3W14) by 11am Friday 3rd March 2017. Entrants’ names (including programme and level of study) must be clearly visible on all pages entered. The judging will take place as soon as possible after the deadline. The judging panel intends to select one winner and a small number of runners-up. The winning entry will be awarded a prize of a new 15” Apple MacBook Pro (worth over £2,000) and runners-up will each win a new 9.7” Apple iPad Pro. Important note: By entering the competition all students are agreeing that the University of Lincoln can use the work for recruitment and marketing purposes. All intellectual property (copyright) of entries will be owned by the University of Lincoln. If you have any questions, please contact Gyles Lingwood (Director of Education, College of Arts): glingwood@lincoln.ac.uk. Have you ever thought about a career in Teaching? The Primary and Secondary Teaching information event will provide you with an opportunity to engage with and talk to members of the School of Education, St. George’s Academy and Lincoln Teaching School Alliance (LTSA), about a career in teaching. Please come along to find out more about our one year school-based training programme. 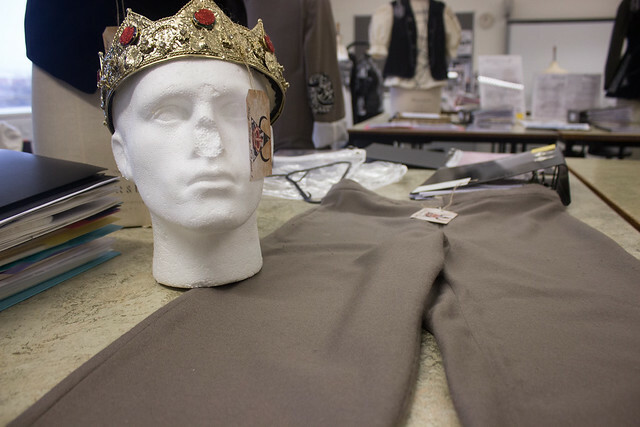 Dressing Cleopatra on a budget isn’t easy but fashion students have been testing their skills to create authentic Shakespeare costumes for just £20. Second year fashion students worked alongside their drama piers to design and create costumes for characters in five separate performances held at the Lincoln Performing Arts Centre this December. Each budding fashion designer was given a play and a character brief, ranging from a comedic old man to a modern prince, before crafting their outfits. They had to estimate the time period based on the play and devise an outfit that incorporated personality and style – all for just £20. The iconic plays included Antony and Cleopatra, Timon of Athen, Othello, Henry IV part 1 and Henry IV part 2. Mollie Hawkesford’s character was Sempronious, an extravagant member of the House of Lords from the play, Timon of Athen. Costume: Leather jacket with embellishments. Character info: Comedic character, large old man. Costume: A bustle for underneath the costume. It’s stuffed and tied at the back with a t-shirt over the top to create a bulging stomach. A waistcoat transformed from a winter coat, the sleeves were removed and the print and embroidery added. Name: Amy Dalley Character: Prince Hal from King Henry IV part 2 Character info: Modern prince, friends with Falstaff. Falstaff is Prince Hals inspiration but by the end of the play he realises Falstaff isn’t actually inspirational. Costume: Embellished waistcoat with buttons and stitching. Screen print and pattern created. Amy Dalley (left) and Lydia Brown (right) showcase their pieces for the performance of King Henry IV part 2. Character info: Very wealthy and over generous with her money. Gives it to her friends and ends up losing all her money and becoming an outcast. Costume: Waistcoat made from scratch and new sleeves added to a bought shirt. Name: Mollie Hawkesford Character: Sempronious from Timon of Athen Character info: New member of House of Lords who is very extravagant. Costume: Trousers and waistcoat made from scratch. Sleeves added to bought shirt. Prints designed and printed using the university Mimaki printers. Name: Jessica Heischen Character: The Fool from Timon of Athen Character info: Androgynous character and figment of Timon’s imagination. Mollie Hawkesford (left) and Dorothy Owens (right) showcase their costumes from the performance Timon of Athens.